Malcolm Galea and Joseph Zammit do their thing in Everything You Need to Know About Science (More or Less). Peter Farrugia reviews two interactive, educational productions by More or Less Theatre and finds them more effective than your garden variety science or history lessons. When a couple of comedians decide to explore The Complete History of Malta (More or Less), you can be sure that entertainment won’t be in short supply. Written by and starring award-winner Malcolm Galea alongside Joseph Zammit (an actor familiar to viewers of national television), this is a fast-paced family performance with plenty of audience participation and uproarious fun. Clocking in at one hour, the duo cram as much of Malta’s tortuous history as possible into the show. In the process, they describe the decline and division of the Roman empire, the intricacies of medieval dynastic inheritance and re-enact the Great Siege in all its glory. 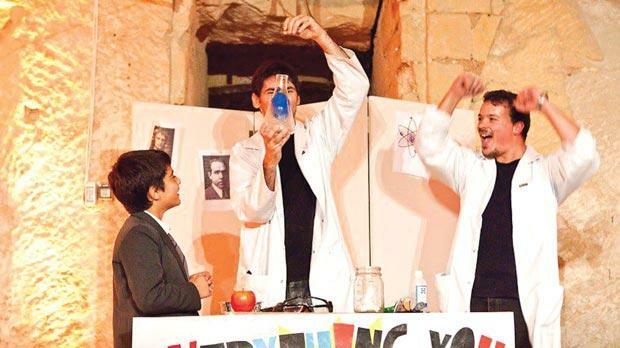 The Complete History of Malta (More or Less), along with Galea’s Everything You Need to Know About Science (More or Less), premiered at the Żigużajg International Arts Festival for Children and Young People and are currently back at St James Cavalier. With wigs, puppets and ridiculous costumes animating a spartan set, Galea and Zammit bring the piece to life with the power of their characterisation and a knack for over-the-top silliness. Young audience members were clamouring for more, while still learning about the island’s intricate past. It’s no small feat to explain the varied layers of dominion, suppression and shifts in cultural milieu experienced on the island, but Galea pulls it off with a light touch. And while it’s important for children to get a sense of their cultural history (heavy baggage for any Maltese kid to carry) in a way that’s more immediately intriguing than whatever they’ve been taught at school, the show underlined important questions about the very foundation of Maltese identity. Presented as a static fixture against the ebb and flow of foreign potentates, Zammit’s relaxed and self-serving representation of the Maltese Everyman is a familiar figure. But the idea that the Maltese, as a stable ethnic group, have somehow endured from Late Antiquity through to the present day (by way of Phoenician sailors and a fateful meeting with St Paul) is provocative, if only because it’s the questionable foundation myth for so much of our ancestral self-image. Equally problematic were the performance’s depictions of Arab and Muslim characters. The Arabs are acknowledged as the source of Malta’s language, the transfer of which is represented as a farewell gift from departing invaders, but not as in any way integral to the cultural identity of the population. Indeed, the challenging reality of a Muslim Malta is glossed over, an interim between periods of established Christianity, a return to which heralds a return to history itself. These are complex themes to weave into a show intended for children, and at its core the show reiterates that same archetypal story about Malta and the Maltese that many of us grew up with and have come to cherish. If the show is able to stimulate discussion around these issues while guaranteeing the same level of enjoyment, it will have succeeded where so many educators and local historians have missed the mark, really getting at the roots of Malta’s fascination with the past. Both More or Less Theatre’s plays are available for school visits, with performances on offer in either English or Maltese, to ensure that any class will benefit from viewing the shows. Teachers looking to present their students with an engaging overview of Maltese history can be assured that The Complete History of Malta (More or Less) will deliver. Indeed, it would be the perfect springboard for a deeper reflection on themes of identity, the process of historical narrative and the Maltese relationship (on an island permeated by the memory of past things) with our own history.